First rumored back in July, Huawei has taken its first public step towards its foldable phone future, with company CEO Richard Yu confirming development of a bendy handset at its Mate 20 launch event this week, as reported by Digital Trends. 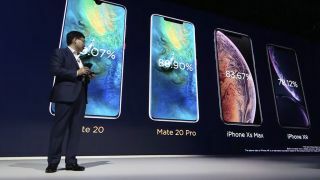 Huawei has spoken about the potential of foldable handsets and its plans for 5G phones in the past, however, this is first time the Chinese phone maker has publicly linked the two in a concrete way. While Huawei has invested heavily in 5G infrastructure over the last year, the telecommunications giant has been frozen out of 5G deployments in key markets, including the US and Australia over concerns that the company may be subject to extrajudicial directions from the Chinese Government. While we wait for the foldable future, we've gone hands-on with Huawei's latest handsets, the Mate 20, Mate 20 Pro and Mate 20 X, and have come away quite impressed in each instance.